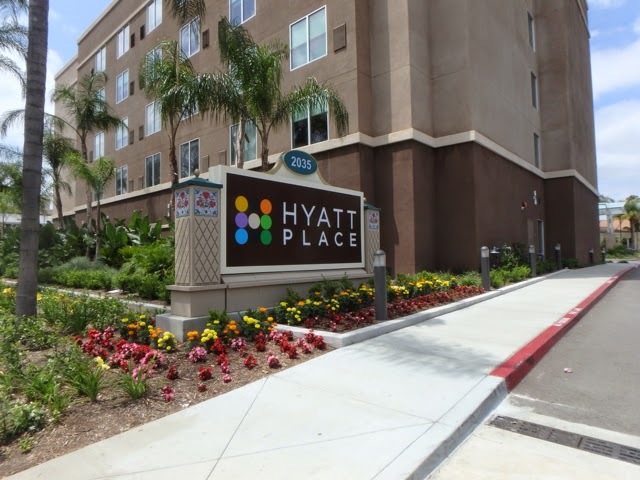 When we lived in AZ we used to always use Mom's Hyatt points and stay at the Hyatt Regency Orange Country. Now that we have to fly we've tried out the Hilton and a Best Western since those are close enough to walk to the parks from. Last D23 Expo the Hilton worked awesome, but we wiped out Mom's points there and they seem to take longer to earn enough for stays compared to Hyatt, which is why she focuses on earning Hyatt points. Thus, we were very excited to see that Hyatt now had one at the convention center when looking at options for the D23 Expo this summer. Being able to use Hyatt points for the hotel also made it feasible to add a May trip this year and make even more use of our Premier annual passes. I messed up on dates when booking the hotel, so I ended up with three separate reservations including two different ADA room types and one night that didn't let me choose an ADA room. Totally my fault in that I accidentally booked the dates I was originally planning the trip, but had actually ended up with an extra day on both ends in order to use mom's airline miles for the trip (yes, I even had finished booking that before the hotel). 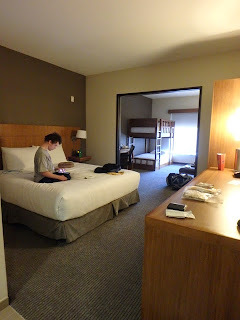 Thus, I was totally okay with our first night being in a non-ADA room as long as we were then moved to what I reserved the rest of the trip. However, the guy at check in talked with his manager and found an ADA room that we could use the whole stay if we just waited a few hours for it to be ready. We ended up with a tub instead of roll-in shower as I mainly booked, but it had a shower seat and it was better than having to change rooms. 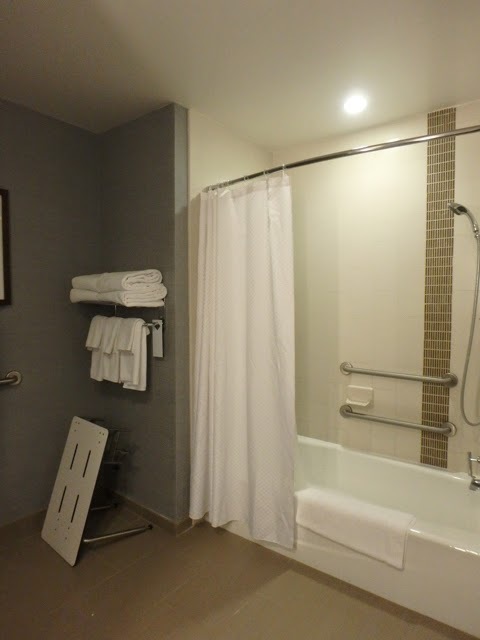 Really just the extra space for wheelchair and grab bar is why we need the ADA rooms, although when possible the roll-in showers are convenient. We ended up in what they called a King specialty room. I have no idea what that means, but we're assuming that is about it having bunk beds in the area with the corner sofa bed. Not having to pull out the sofa and still have two beds (well, actually three, but we only used two) was very convenient. 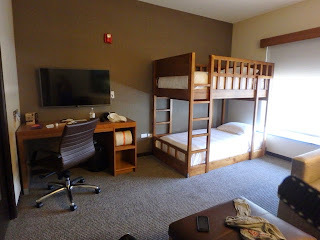 We have long loved Hyatt Places for not only the cheaper point cost, but it being like two rooms with the sitting area and the bed/beds area. 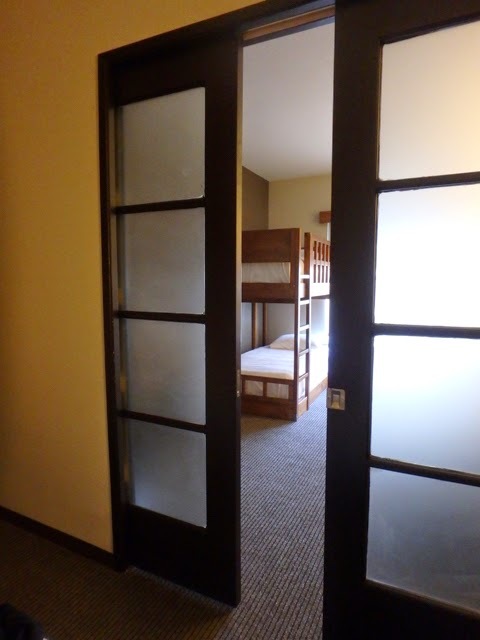 This one worked out even better than the others we've stayed at because it really is two rooms with sliding doors that close between the two areas. This might also be a specialty room feature. Another nice feature is that the blinds are controlled with a remote, which is something I've always wanted for home and now Mik understands why I think it'd be awesome. Of course, he also enjoyed that we each had a TV and it was DirecTV so he knew the channel numbers for his sports and other favs, which was a real treat for him now that we can't have DirecTV and we axed the not as good more expensive Comcast. Overall we really enjoyed our stay at the Hyatt Place Anaheim Resort/Convention Center. The staff was always very friendly, attentive, and welcoming. And we actually did have to interact with them several times because our keycard kept getting demagnetized the first two days and we also mistakenly were charged for parking. The breakfast was as expected, although with food being one of Mik's favorite parts of Disney we mostly skipped it. As much as we love this place, it's borderline far to walk to parks. Totally will be great for D23 Expo and would stay for other future trips, but the Hyatt House under construction even closer to Disneyland is an extremely appealing option once it opens this December. It'll probably be more points, but weighing that with being closer and having a kitchen may make it our pick for Disneyland when we can't use DVC for Grand Californian. Until then, though, the Hyatt Place is enjoyable and makes it possible we may be able to do Disneyland not just every other year for the Expo again, especially if we can snag mileage award tickets to/from Orange County with mom's miles, which doesn't seem to be easy without planning way in advance (6-9 months) and/or being extremely flexible (ex. flying up to Seattle to get to D.C. and 3 hour layovers). Hint/Shoutout to Mom: Keep traveling for work and racking up the American miles and Hyatt points, please. We love them almost as much as you!